Having figured out how to work together, “co-dads” Rusty (Mark Wahlberg) and Brad (Will Ferrell) decide to have their first Together Christmas. Instead of shuffling the kids between houses, Rusty, his wife Karen (Alessandra Ambrosio), Karen’s daughter Adrianna (Didi Costine), Brad, Sara (Linda Cardellini), Griff – Brad and Sara’s baby, Megan (Scarlett Estevez) and Dylan (Owen Vaccaro) – Rusty and Sara’s kids, will all spend the holiday together. Adding to the mix, Rusty’s absentee father Kurt (Mel Gibson) calls to say he’s coming for Christmas. Despite not being a good father himself, Kurt is concerned with the way Brad may be influencing Megan and Dylan. When Brad’s father (John Lithgow) shows up and he sees how overly affectionate he and Brad are, Kurt’s fears are confirmed. Trying to drive a wedge between Rusty and Brad, Kurt books an Air BNB for everyone. He is hoping that being confined in such a close space will cause Rusty and Brad’s relationship to crack. As he pokes and prods, Kurt’s plan is starting to work. Hollywood has long had an issue with sequels. Most of the time, the sequel either completely falls short or they try so hard to outdo the original that they go too far over the top. Daddy’s Home 2 is one of the growing number of sequels to live up to its predecessor. Mark Wahlberg and Will Ferrell’s characters have grown up a lot since we last saw them. They have put aside their petty squabbles and jealousy to try to be the best dads they can be for their shared kids. Wahlberg and Ferrell have good chemistry. Ferrell’s goofy do-good dad plays well off Wahlberg’s tough but trying to be better dad. Ferrell’s goofiness is taken up a few notches when he teams up with John Lithgow. Mel Gibson is a super macho guy who doesn’t want his grandkids being tainted by their stepdad. He is “old school” and thinks his son has gone soft. Mel comes across a little over the top, but he does it well. 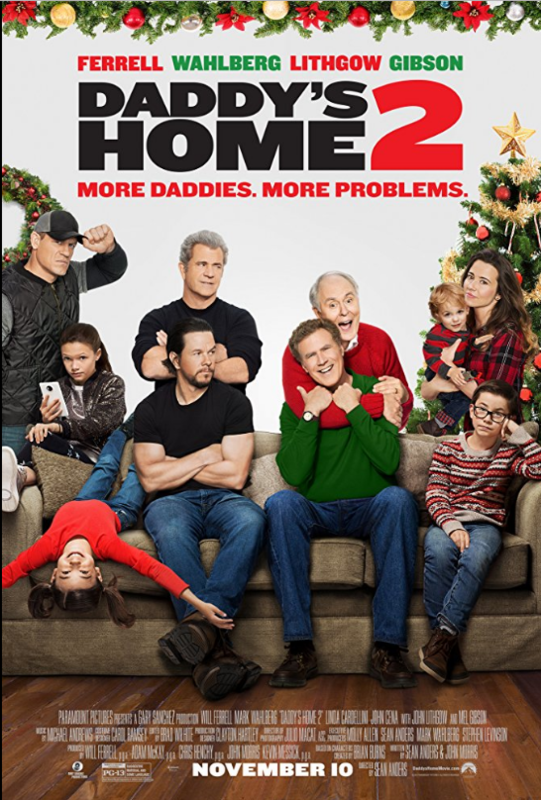 Daddy’s Home 2 is a basic family conflict Christmas movie. The jokes are pretty much nonstop. A lot of them are based on pitting the affectionate father and son against the gruff, macho pair. Some of the gags repeat themselves a few times, but there is enough going on between them that they don’t get old. The story itself may be a little cheesy and predictable, but it is a fun ride. In the vein of National Lampoons Christmas Vacation, Daddy’s Home 2 takes the typical Christmas movie to hilarious extremes. It has enough heart that the silliness feels a little more grounded. If you liked the first Daddy’s Home, you will definitely like this on. It may just find its way into your Christmas movie rotation.